Our folding gaming table is back in stock! 6 by 4 feet gaming table creates perfect area for your games of Warhammer 40k or any other board games or wargames. 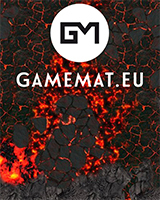 Gamemat.eu is the producer of gaming mats suitable for wargaming hobby. Our goal is to offer you fantastic looking and highly practical G-Mats which will make every table into real battlefield.